Aisles of snacks and beverages at a Walgreens store in Downtown Crossing in Boston. How will you choose what to eat today? I’d guess that however you make the decision, it will have nothing to do with rounding out your weekly intake of magnesium or potassium. More likely, breakfast is a choice between what’s in the fridge and a stop at the drive thru. Will lunch be leftovers or a sandwich from the deli? When you leave work, will you pick up food on the way home or cook when you get there? And yet we talk about diet in terms of food groups and nutrients, as if we choose what to eat and then go out and buy it. Maybe there is more value in looking at it the other way around: What if where we buy our food in part determines what we eat? It might seem like a question of semantics, but a deep look into the 571 pages of the U.S. Department of Agriculture’s 2015 dietary guidelines report suggests our diets vary depending on where our meals are purchased. The report, submitted to Congress every five years by the Dietary Guidelines Advisory Committee, is filled with data about what we eat and what we know about nutrition. What it doesn’t say is that getting people to eat healthy foods isn’t as simple as telling them what to eat. Most people know that excess sugar is bad, but we get more than 13 percent of our calories from soda and desserts. A typical 10-year-old girl might consume as many calories worth of sweets as she does of sandwiches. An average 75-year-old man may eat almost twice as many calories worth of desserts as a 40-year-old. Looking through the report, I noticed the committee had requested a breakdown of what we eat by point of purchase. The charts suggest that where we shop influences the makeup of the nutrients we eat. Looking at places where we buy food (stores, full-service restaurants, fast food places, and school or day care1) by age group revealed some interesting trends. Take vegetables, one of the few foods that almost every study and researcher can agree that we need to eat, and eat more of. Ninety percent of the country eats less than the recommended daily intake; boys ages 9 to 13 are the worst, with just 1 percent consuming the 2 to 2.5 cups per day recommended for their age group. 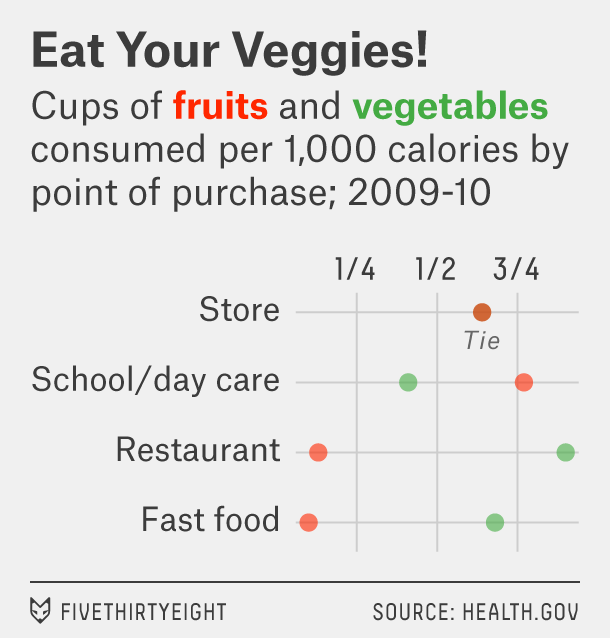 We buy the majority (69 percent) of our calories at stores,2 but it turns out we eat more vegetables per calorie when we buy food from a restaurant than from a store or school. Whether the problem is that people don’t know how to cook vegetables or just don’t have the time, finding ways to get Americans to eat more vegetables at home could be the key to introducing more greens into our diet. When it comes to grains, we eat a lot more refined grains than whole ones no matter where we shop, but the proportions are much worse at restaurants. A typical 20- to 40-year-old will eat just 0.07 ounces of whole grains per thousand calories at any type of restaurant, while she’ll get 3.80 ounces of refined grains at a fast food restaurant and 2.68 at a full-service restaurant. This year’s report took a stronger stance on sugar than previous versions, pointing to the mounting evidence that added sugars are associated with obesity and chronic diseases. 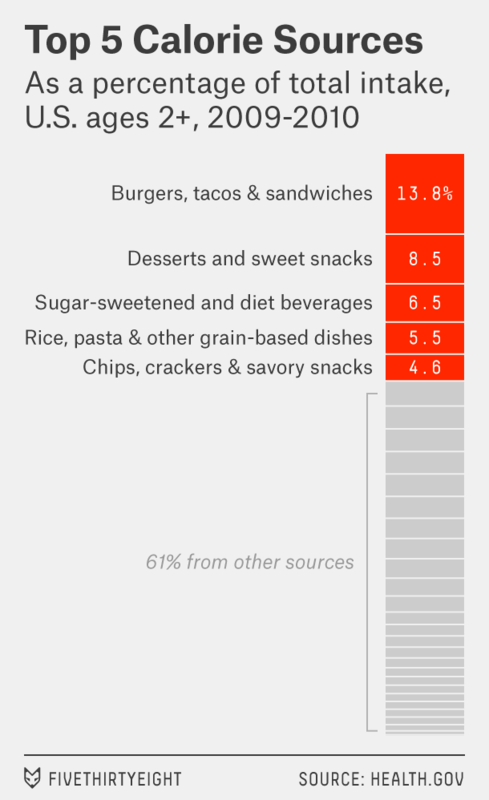 Added sugars are abundant in food at every point of purchase (though there’s generally more in food bought in stores than in restaurants) for every age group. While the report recommends we limit added sugar to 12 teaspoons daily, 12- to 19-year-olds get that much sugar per 1,000 calories purchased from the store. That’s nearly twice the amount they get from food purchased at school. This suggests that previous versions of this report have succeeded in one area: Unlike what we eat at home or at a restaurant, the food served in schools seems to have been heavily influenced by the USDA’s guidelines. Researchers note that the changes may be working; kids are gaining weight in the summer, when they’re not in school, and maintaining healthier weights during the school year. If we want to change our diets, maybe we need to think about why the food we buy at the store has so much sugar and so few vegetables. The committee recommended we eat more meals at home, but while that will get us more fruit and less sodium, it’s not going to increase our vegetable intake unless we change our habits. A more useful recommendation might be to buy the bread with no added sugar and to put some vegetables on that sandwich. While schools and day cares may not be obvious places to purchase meals, more than 31 million kids get their lunch from school each day, and some also receive breakfast, making it an important food source. Stores represent a majority of food purchases, but more data about what kind of stores — e.g. bodegas or grocery stores — wasn’t available.